Many thanks to Ultrabook-king for their help in getting us the Dell XPS 12 for review. Our German readers might want to take a look and bookmark them. 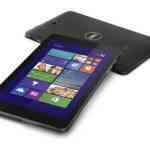 Dell XPS 12 Review model full specs. Dell XPS Specs, images, review links and videos are always available in our database. Ports: 2xUSB3.0 (1xsleep and charge,) 1xMini Display Port, 1 x headset port. Ambient light sensor, rotation sensor. TPM 1.2 module, No VPro, Sealed battery. No expansion ports or access covers. You’ll find a detailed first impressions post on the site and a video review below. Top marks to Dell! 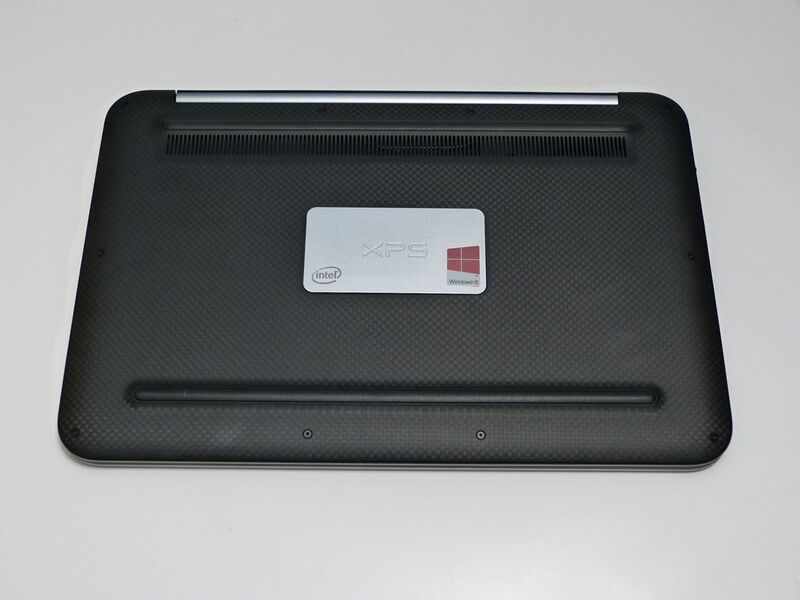 The XPS 12 is a pleasure to look at and to hold. The quality of the finishing is excellent and the materials used are of high quality. 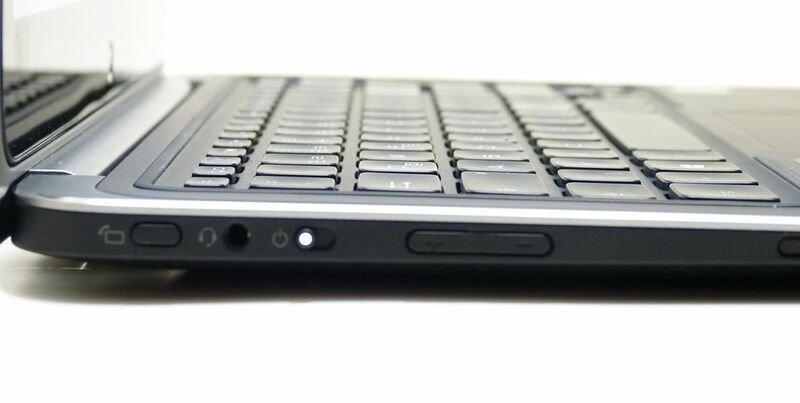 We like the rubberized finish around the Ultrabook and the fact that this continues around the keyboard. As you may have seen, the screen rotates inside a frame to provide a tablet-like experience when needed. The screen rotation mechanism works very smoothly. Because of the use of a frame around the screen there’s no place to put tablet controls. 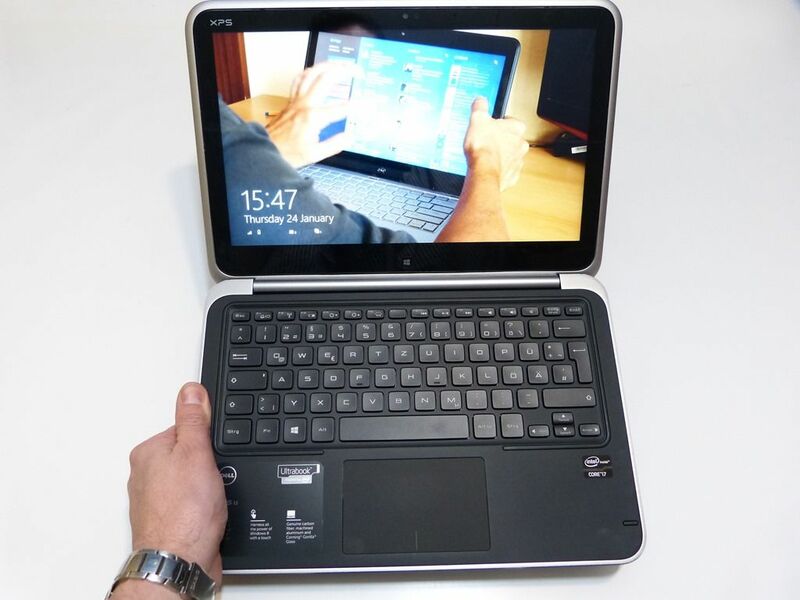 As a result the controls for power-on, volume and rotation lock, controls that need to be on the outside when the Ultrabook is ‘closed’, are positioned where you usually find connectivity ports. The end result is that there isn’t much space for ports so you end up with two USB3.0 ports and a Mini Display Port. There’s no SD card slot which a real shame for photographers and videographers given the quality of the screen. 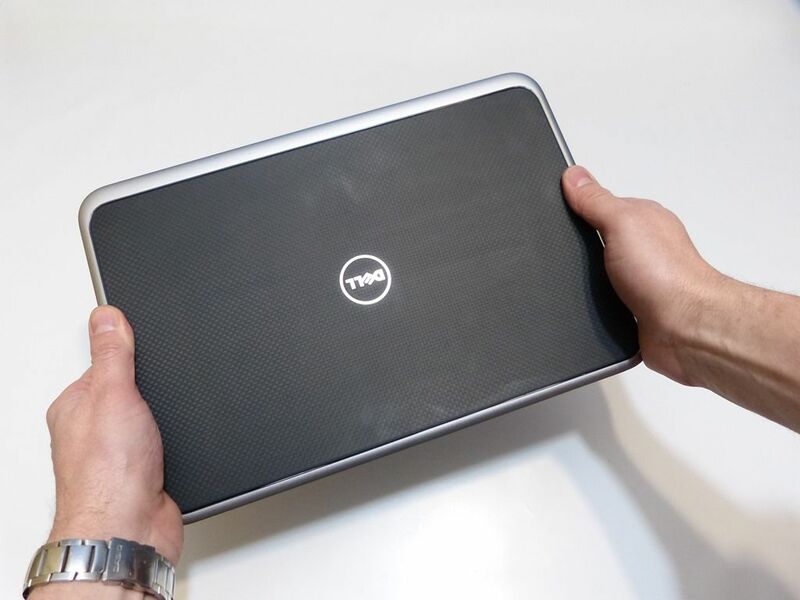 The Dell XPS 12 weighs 1.5KG / 3.35lb which, for a 12.5” Ultrabook isn’t the lightest but for the convertible category, about what should be expected at the moment. 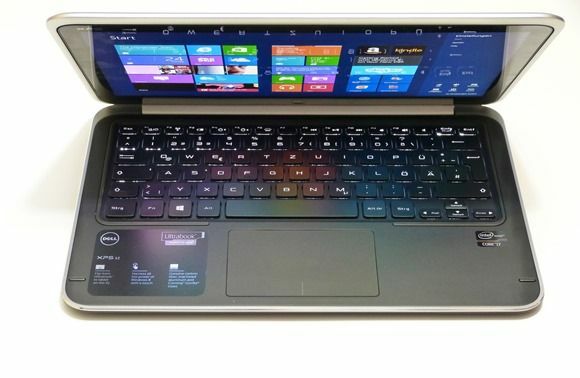 Again, Dell have done a good job here and although the screen might be the specification highlight, in terms of usability, the keyboard was the highlight for us. 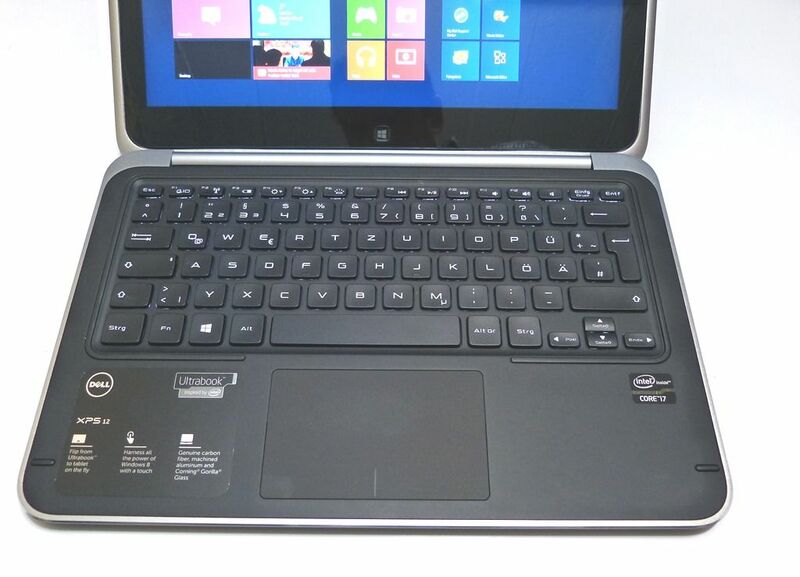 Reliable, comfortable, back-lit and up there with the best of the Ultrabooks that we’ve tested. The screen has wide viewing angles and good brightness and color. 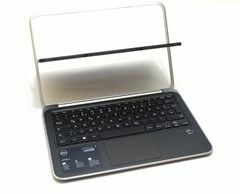 The touchpad gave us a few surprises with jumping pointers and movements interpreted as Windows 8 side-screen swipes. Multi-touch control seemed good. Moving on to the screen. 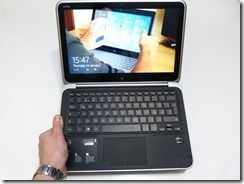 It’s exciting but we’re not convinced that at 12.5” Ultrabook needs a full HD screen for a few reasons. The first is that although font sizes on Windows Desktop had been enlarged, there’s still a problem with selecting things with a finger. A boost to 150% font sizes results in some ugly looking icons and fonts. The modern UI of Windows 8 apps seems to be better suited to boosting fonts but we even saw problems here. Bing news, for example, prevented the display of some articles’ second pages when in large-font mode. The second issue is one of power usage. In battery life tests we detected high power usage on 50FPS Full HD playback. Although we haven’t been able to conclusively prove it, the feeling remains that 1600×900 would be a far better all-round compromise and that the GPU has to work harder for the higher resolution. 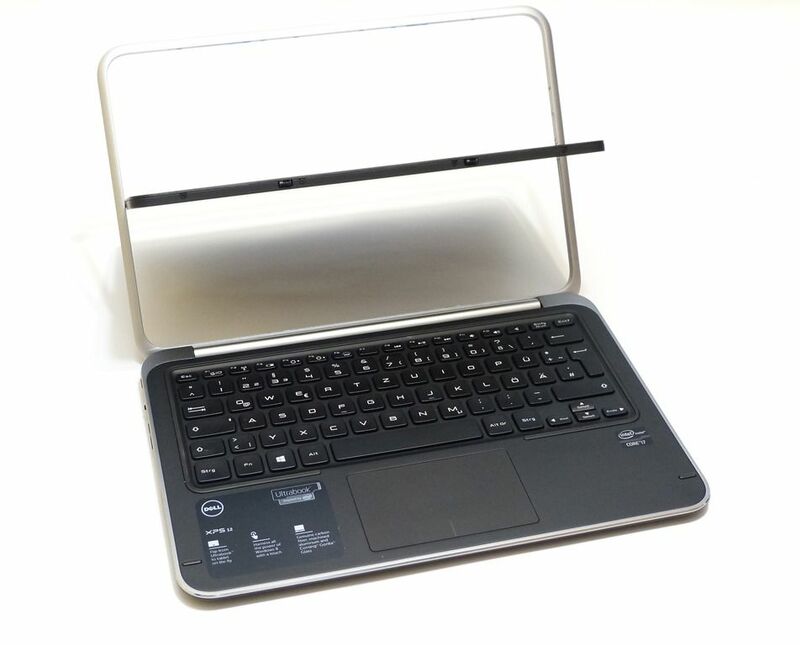 As with the Lenovo Yoga 13 the Dell XPS 13 has the same issues of weight, size and input method. The Dell XPS 12 is slightly easier to turn into tablet mode but once in that mode you won’t want to be holding it for too long. 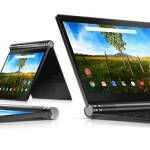 The XPS 12 stays quiet (fan off) for a bit longer than the Lenovo Yoga 13. Do make sure you bump up the fonts in both desktop and Modern UI because the defaults are a little too small for finger control. 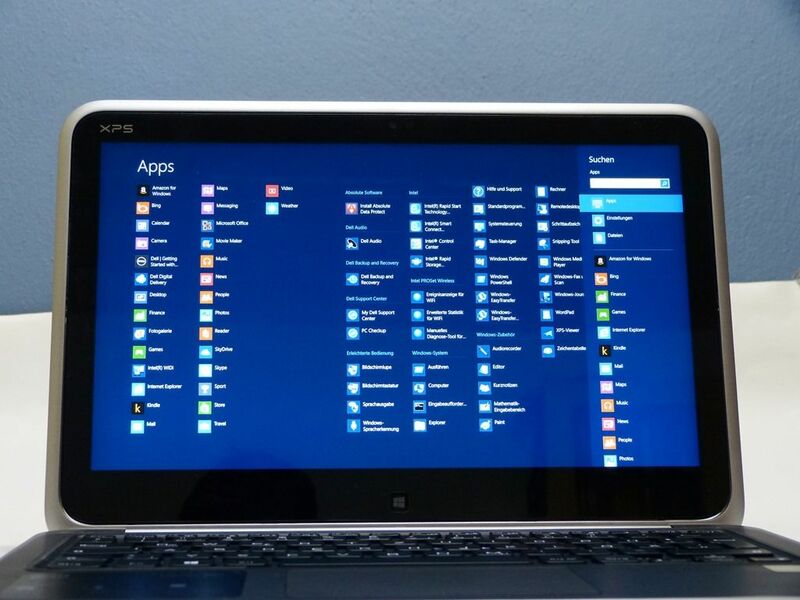 On a table-top the Dell XPS 13 is missing what we regard as an important feature – digitizer input. Without the digitizer input there’s no way to get the precise input needed for annotations, handwriting input (if wanted) or detailed editing of images, videos and other media. Without the digitizer the user is left with the Modern UI and Windows 8 apps as the best option and that (at this stage) reduces the number of usable scenarios. We enjoyed using the Dell XPS 12 in ‘easel’ mode as a display unit (great for videos and reading news over breakfast) but text input in this mode is awkward. Is tablet mode worth having? We think it adds excitement to the product and encourages people to think about different usage scenarios but for those looking to use this amount of screen real estate professionally, the digitizer needs to be added. Speaking from an owner’s perspective. Performance: I can’t vouch for your performance claim. Having the almost exact setup but with 128GB SSD, it performs slower. Other earlier reviews also stated the same. In advanced power options, it states that the CPU is set at 15W. Although cTDP seemed like a fixed setting option, I guess there’s room for some adjustments by the manufacturers. The 15W TDP limits the performance. Video playback and battery life: While it can handle 1080p videos well, you’ll realistically only be using it on Youtube, because you aren’t going to store lots of videos on the SSD. On Balanced setting, the device uses about 9W playing local standard definition videos, which means it gets little over 5 hours of battery life. Gaming and battery life: Balanced setting will get it playable in League of Legends on its default, 1920×1080(lower resolutions aren’t feasible for various reasons), with settings mostly on high. I reckon it’ll last little over 2.5 hours. Starcraft 2 plays on medium 1920×1080 for little over 2 hours. Idle power use and Windows 8: It seems these Windows 8 based systems are using somewhat more power than Windows 7 systems. It measured 4.7W screen off, WiFi/Sound On. Putting the display on low brightness on idle only added 1W. Battery life in general: There’s still bit of times where battery life and power use can be unpredictable. Sometimes the fan will spin right out of idle for no reason, and even the power use would be slightly higher than others. Reboot fixes it, but plugging it back in later to charge battery often causes it to come back. WiFi performance is not that good, especially in power saver mode. Often on waking up, I need to manually connect to get access. 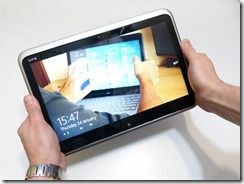 Tablet mode and form factor: I like the flip screen form factor. You don’t need the Yoga 13 for “presentation” mode when the XPS 12 can do the same much easier(with the caveat that you need to first orient the screen to be upright position in “presentation” mode before locking it. The Dell customized graphics driver simply orients it to correct position once you go back to Laptop mode). Also, if you don’t want to mess up the keyboard while watching videos, or you just want it close to you, I simply flip the display and position the screen at an angle I like. That’s very useful. 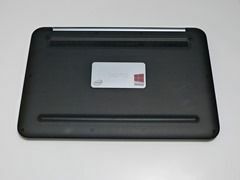 « Digitizers and Ultrabooks. What People Want, Design Recommendations and Developer Tips.